This website makes an important historical source of the First World War accessible to the general reader. It contains digitisation and translations of a German-language newspaper which was produced in Stobs Internment Camp near Hawick in the Scottish Borders. 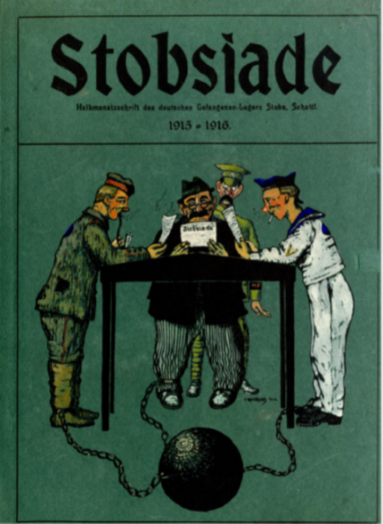 So far the Stobsiade has been hidden away in archives and only accessible to those with a good command of German. We hope that readers will enjoy reading its pages which give invaluable insights into a First World War internment camp. What was the daily routine? What did prisoners feel, miss - and enjoy? What activities did they organise to keep themselves mentally active and physically fit and escape the biggest enemy, boredom? The picture on the right was a cover for folders in which readers of the newspaper would retain their copies. It was obviously intended that a collection of the newspaper would provide some basis for former prisoners to reminisce about – or at least remember - their time at the camp. It depicts a sailor, a civilian and a soldier all chained up, but happily engrossed in reading the newspaper, while a suspicious-looking censor hovers in the background. The comments and interpretations will guide the reader through the pages of the Stobsiade. The translations, comments and website were completed by David and Sheila Sutherland as part of the Stobs Camp Project, which deals with the overall history of the camp. The website is funded by the Arts and Humanities Research Council (AHRC) within a wider project led by Professor Stefan Manz (Aston University Birmingham) and Professor Anne Schwan (Edinburgh Napier University). It is one of the many resources offered by the Internment Research Centre in Hawick.